It's Hip 2 Serve! : Yoplait and My Blog Spark Giveaway!! 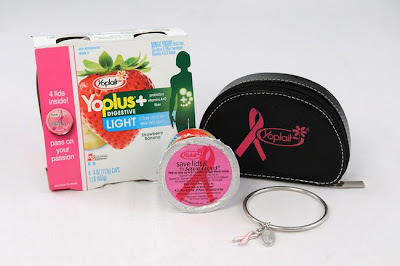 Thanks to Yoplait's Save Lids to Save Lives Campaign and My Blog Spark, I am offering a new giveaway. The winner of this giveaway will receive a "Promise to Make a Difference" gift that will include a FREE coupon for Yoplait YoPlus Yogurt, a breast cancer awareness bracelet, and a leather jewelry case. Even if you are not a winner. I encourage to save all your pink Yoplait yogurt lids because for every pink lid you send in by December 31, 2009, Yoplait will donate 10 cents to Susan G. Komen for the Cure, up to $1.5 million! If you are intersted in entering this giveaway, please post a comment which your first name and email address no later than Wednesday November 18th at 5 PM Eastern Standard Time. I will announce the randomly selected winner sometime Thursday morning. Good Luck!